Dr. Pothuri inspires your confidence with his skill and knowledge. He truly listens and always has time to answer questions and ensure as his patience, you fully understand any procedure you will receive or plan of care. The office staff is also very courteous and helpful and you will love that appointments run on time. Highly recommend. Great team to work with. They made the experience fast and easy. Dr Pothuri is very understanding and knowledgeable. Always listens to your concerns. Have never been to a Dr., let alone a Specialist that was so easy to contact and communicate with! Dr. Pothuri was thorough and personable at the same time. Dr. Puthori is very understanding and knowledgeable. I believe he will work until he understands what is wrong and then be able to resolve my issues. The staff is very friendly and helpful. This Doctor takes care of business. on time/schedule. this is one of the most important criteria for me regarding appointments. Easy to make an appointment. Excellent visit! Very efficient and timely. Dr. And his staff friendly, knowledgeable and efficient. I would recommend. My overall experience was great. Dr. Pothuri carefully explained the procedure and answered all questions, calming any anxiety I had about the procedure. 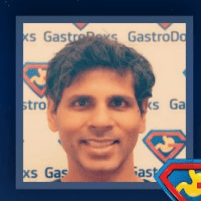 I would Dr. Pothuri to anyone looking for a gastroenterologist. Dr. Pothuri was very easy to talk to and very attentive to my concerns and medical situation. He immediately began treatment. I am looking forward to continued treatment to hopefully helping me improve quality of life.